May Father's Day die releases! Father's Day is the day we all get to thank our Fathers for all the wisdom and life lessons they have taught us. A Father's love is unconditional and one that I won't forget. My father is in heaven but not one day goes by that I can't feel his love. Tutti Designs just released some of the best dies for Father's day, these dies will be some of the most used in your collection. Tutti Designs has some of the best dies around so be sure to check them out in the store! Adhere back ground patterned paper to card base. 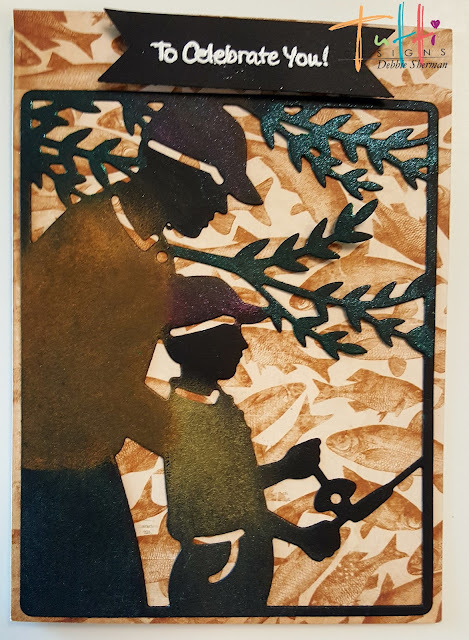 I die cut the Fishing Buddies die from black card stock and adhered it to the card leaving room at the top for the sentiment. I rubbed some Gelatos on the die cut to give it a little color. Looks awesome Debbie! Love how you've added the gelatos color to the image ... great idea! This is a wonderful masculine design! 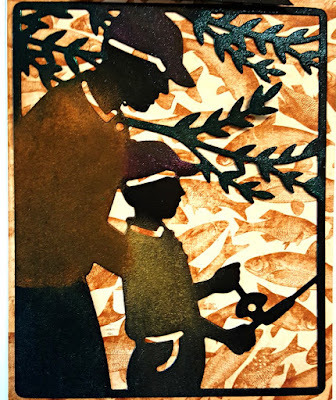 I love that fishing buddy die and spent many a day fishing with my Dad too! That fish background Designer Paper looks awesome too! My Pa Pa . . . Happy Fathers Day with the Beer Set, Cheers! Happy Father Day with a Tool Frame.